Overdrive have just released a new feature allowing users to renew eBooks and Audiobooks they have borrowed from the library. 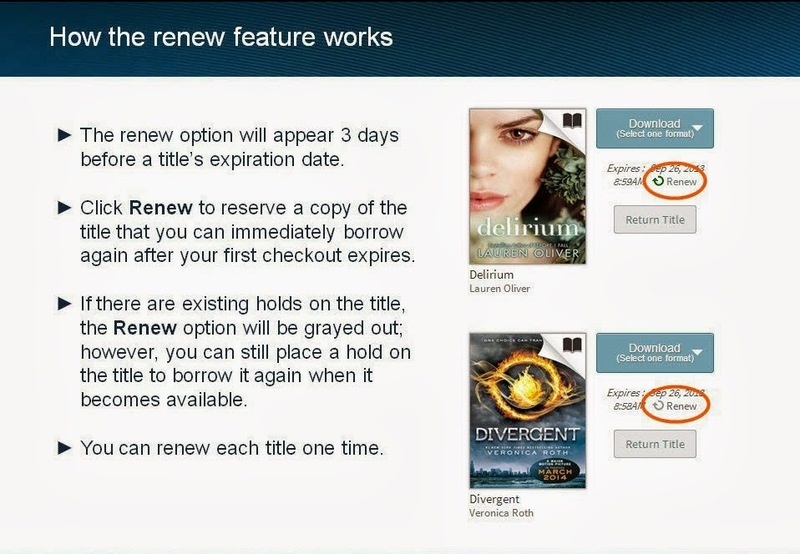 Three days before your Overdrive titles are due to expire you will see an option to renew them in your Overdrive bookshelf. Overdrive renewals work just like reserves. If no one else has a hold on the title you have borrowed you can renew the title. Overdrive will send you an email with a link to checkout and download the title again immediately after your first loan expires. If, however, other people are waiting for the title you can still use the renew link but it will place a hold on the title and you will go to the end of the queue. To renew an Overdrive title simply login to your account on the Sutherland Library Overdrive website or via the Overdrive Media Console app on your device and navigate to your Bookshelf. You will see the renew option appear next to each title 3 days before it is due to expire. You can see titles you have renewed under Holds on your account. Note that you can only renew each title once. If you have any problems using renewals or any other features of Overdrive eBooks and Audiobooks please drop in and ask at any branch library or email us at overdrive@ssc.nsw.gov.au and we'll do our best to help.